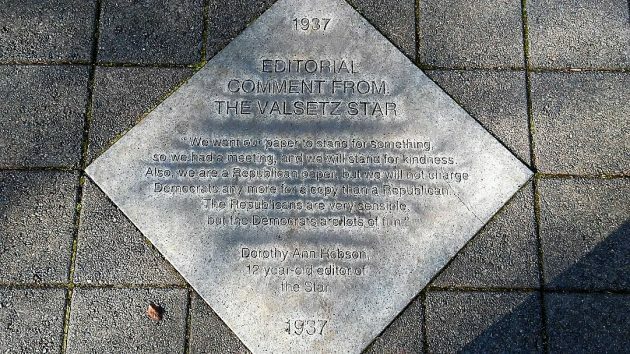 Strolling around the Capitol grounds in Salem the other day, I came across the late Dorothy Anne Hobson in the form of this plaque on the ground. She had a lot more to say back in the day, when she was a young girl, all of it straight to the point. 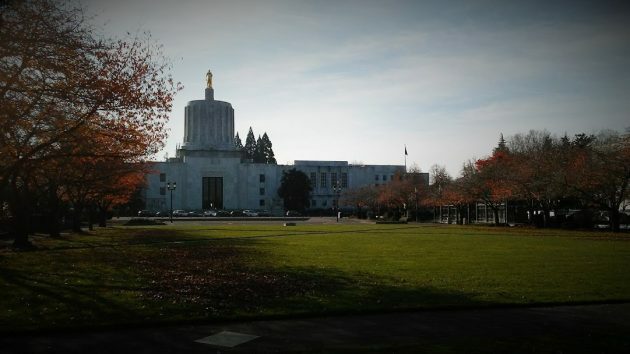 Young Dorothy became famous around the country, but I’m embarrassed to admit I had never heard of her before seeing her name on the Capitol mall. I’ve read about her since, notably what newspaperman and OSU instructor Finn John wrote about her in his “OffbeatOregon” column in 2013. I also sent away for the 2000 book “The Valsetz Star” by Ron Fowler, and now I’ve read some of that. Dorothy Anne Hobson lived from 1928 until 1996. When she was 9, in 1937, living with her parents in Valsetz, she started a monthly paper for the isolated lumber company town in the Coast Range. It was written in pencil and then typed up and mimeographed in the Portland office of lumber broker Herbert Templeton, who sent it to his contacts across the country and the world. She kept it up for four years, quitting only when she started at Parrish Junior High in Salem. And so it went, month after month, until December 1941, when Dorothy Anne shut down the Star to devote herself to junior high and never published another word. She was honored as an invited guest at the last commencement of Valsetz High School, just before the town was razed in 1984. This is the araa where you’ll find walkway plaques recognizing notable people and events. That we should have budding reporters locally, such as Ms. Hobson, would be a good thing! Good story…! Great story, Hasso. My 91-year-old Dad spent some of his childhood in logging camps in the Coast Range, so this was especially fun to read. So, a child has an idea to produce a local interest paper. She succeeds. Wonder what became of the youngster. My eyes are too old even with my new expensive glasses. So got out the magnifying glass, and still can’t read the plaque….except something, I think, about newspapers should be kind and “we are Republicans” and something comparing Republicans to Democrats. I think it says Republicans are very sensible, but Democrats are a lot of fun. Nice story, Hasso. Thank you. I graduated from Willamette Univ with Dorothy, she was an interesting person. Eleanor Roosevelt was a great fan of hers and quoted her often in her national newspaper column.